Clockspot has no long-term contracts, and payments are month to month, so you can cancel your subscription at any time. 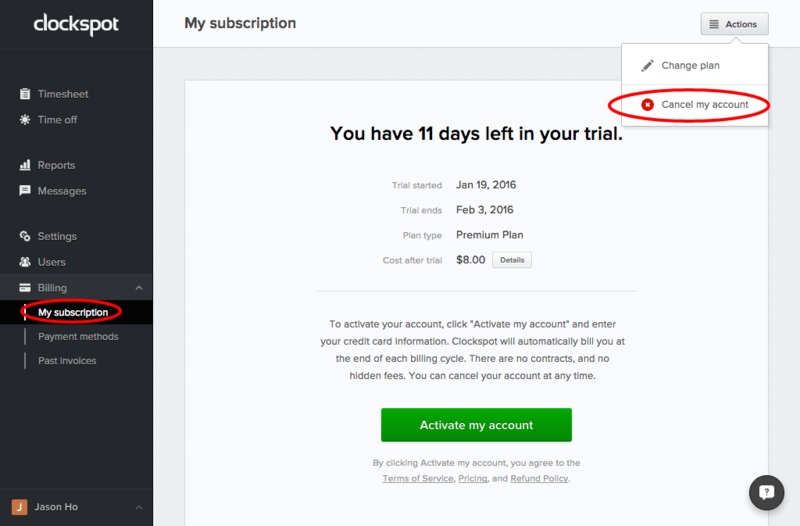 To do this, go to Billing > My subscription, click “Actions”, then select “Cancel my account”. Once you confirm the cancellation, your account will be flagged for deactivation at the end of your billing cycle. You will no longer be charged. Note that we do not guarantee that your data will still be available after you cancel. However, if available, you can always reactivate your account by going back to Billing and clicking “Activate my account”.